Tina finally got around to it in the slow time after Christmas, and here it is! Please be patient as there might still be some missing images or incorrect links. 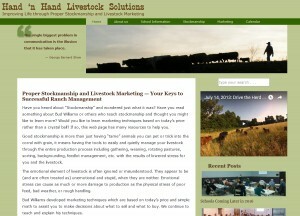 If you find any, please email Tina at tina@handnhandlivestocksolutions.com and let her know so she can fix them! Meanwhile, look around and see what we have to offer in our new site! Like the new look.I have perfected shovel snow out of feed bunks !lol. The website looks good.